Over the years, I have worked with a number of clients suffering with fibromyalgia. In all of these cases, people came to me having heard that my sessions brought more relief than just massage therapy (which they were already receiving). I don’t for one minute believe that my skills as a massage therapist exceeded those of the other therapists – but I did have an advantage. My protocol was to first do foot reflexology to relax the nervous system and then massage the targeted areas of tenderness. Without fail, the addition of reflexology – given first – got far better results than just massage. Studies on fibromyalgia (FM) are beginning to explain why reflexology is such an effective approach to this chronic condition. The research now points to FM as a central nervous system (CNS) disorder, not an autoimmune affliction of the peripheral tissue, as once believed. Since reflexology has such a strong positive influence on the nervous system, it makes sense that it can provide such positive benefits for people with FM. 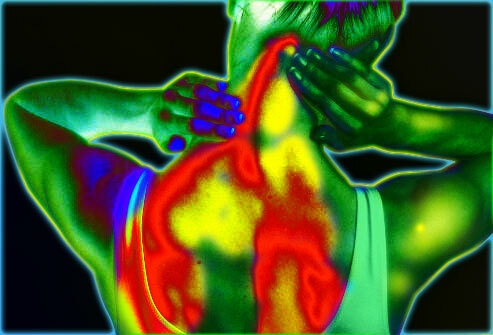 Fibromyalgia affects more than 3 million Americans, mostly women. It is a complex chronic disorder characterized by primary symptoms of widespread muscle pain and tenderness, fatigue, headaches, difficulty sleeping and irritable bowel syndrome. fMRI tests show that when people with fibromyalgia are exposed to non-painful stimuli, areas of the brain are activated that normally are only activated by painful stimuli. Researchers believe that this may explain why people suffering with FM are often hypersensitive to all sorts of stimuli, such as light, sound, certain foods, heat and/or cold, not just pressure or touch. Review of a study of 600 participants with FM suggested that trauma often causes a person’s limbic system to go into overdrive, contributing to the CNS hypersensitivity as discovered in other studies. Working with the fibromyalgia population is definitely not a one size fits all situation. What works for one person may not for another, so flexibility, patience and compassion are essential. Most people dealing with FM find multiple strategies necessary in order to even decrease stress, improve sleep, reduce depression, and reach any level of daily functionality. Approaches, such as gentle reflexology and massage, acupuncture, yoga, as well as prescription meds are common methods amongst sufferers. I can tell you though, from my own personal experience, that to bring any level of relief to people living with fibromyalgia is very rewarding. I encourage you to offer reflexology to those you know with FM, and if you’re also a massage therapist, add that in as well to add to the results. Michael J. Schneider, DC, PhD, David M. Brady, ND, DC, and Stephen M. Perle, DC, MS (2006) Differential diagnosis of fibromyalgia syndrome: Proposal of a model and algorithm for patients presenting with the primary symptom of chronic widespread pain. J Manipulative Physiol Ther. 2006 Jul-Aug;29(6):493-501. I have fibromyalgia….. I find that I greatly benefit from regular reflexology session s. I feel so relaxed afterwards. Your welcome Ruth. Thanks for taking the time to comment. As a holistic therapist and having had fibromyalgia for 11 years I agree with your approach. It’s refreshing to read an article discussing fibromyalgia that is actually factually correct! So many people, including other therapists and even doctors, are not up to date with the latest research and still think that fibromyalgia is either an autoimmune disorder, is rheumatological, or worse- psychosomatic. Offering reflexology before massage is a great idea. I’m glad you acknowledge that no two people with fibromyalgia will be the same, especially given that there are over 60 known symptoms associated with the condition not to mention the dozens of potential comorbid conditions. Keep up the good work! Thanks for your comments Denise. It sounds like you have some experience with fibromyalgia and have learned a lot.